The Anza-Borrego Desert 75 miles east of San Diego is one of the driest places on earth, but it once was a tropical oasis with lush rain forests. A wealth of marine and terrestrial fossils can still be found on the valley floor where the Colorado River delta met with the ancient Sea of Cortez. Over the centuries, streams, rivers and waterfalls carved tight canyons and formed lakes with rich plant and animal life. Eventually, the shifting tectonic plates with which Californians are well familiar gave rise to the Santa Rosa mountain range, and moist air from the coast was trapped on the western side. Gradually, the once abundant watershed gave way to arid desert. On a recent tour of the Anza-Borrego Desert State Park with California Overland Desert Excursions, we saw signs of water still in evidence, even as the sun was sapping moisture from our skin as soon as it appeared. California Overland, based in Borrego Springs, offers escorted journeys to some of the desert’s wonders in former military vehicles. The tours are of variable lengths—from two hours to overnight outings—which means that you can get just a taste of the vastness of California’s largest state park or immerse yourself in it wholly. There are two types of people in the world: those who belong in the desert, and those who really don’t. Our guide for a four-hour tour, Rich Magargal, definitely belongs to the first group. Like the plants and animals that have managed to carve out a niche in this harsh environment, Magargal has adapted to the heat and dry climate, and notices the details that others might miss—details that can make the difference between life and death. Leading a tour group that included myself, my husband, our two sons, and several other visitors from around the world, Magargal paraphrased Bette Davis—“Fasten your seatbelts; it’s going to be a bumpy ride”—and we were off. Our first stop was Clark Dry Lake, the first of many dry water features we would see. Clark Dry Lake is a 10,000-year-old playa, an alkali flat, that only occasionally holds any water. Magargal told us of an unusually wet season when the rains came and, for only a day or two, Clark Dry Lake had enough water in it that a few local lads were able to bring out kayaks to cross from one side to the other, just to say they had. For the most part, however, the dry lake never changes. During World War II, the playa was used as a training base for the U.S. Air Force; some of the tire tracks from military vehicles can still be found on the flats. There are other signs of military training in the area, and it is well worth a look for people interested in military history. Nearby is Coyote Canyon and Alcoholic Pass, which received its name because it was the hiking path farmhands from the Clark Ranch took to town to get a drink. The moniker has stuck for more than 100 years. On our way to the next stop, Slot Canyon, we took a brief pause near the calcite mine, more relics from World War II when calcite from the area was used to make bombsights. Just past the mine, we stopped to have a fabulous lunch prepared by Overland Adventures—the brownies may be worth the price of admission alone—before hiking through the canyon. As we walked around and occasionally scrambled over rocks, Magargal told us that there are two ways to die in the desert—from dehydration and drowning. Slot Canyon is a monument to the water in absentia. Throughout this moderately easy but amazing hike are dry waterfalls that show the path of flash floods. In mid-May, there were still desert flowers in bloom, an indication of moisture earlier in the spring. The tight, twisting pathway within the rust-colored walls of Slot Canyon reminded me of photos from the ancient city of Petra. The canyon itself is an ancient waterway, and the walls have been carved and smoothed over the millennia by water, wind and time. By now, the sun was beating down on us, but it was not nearly as hot as it would get in the summer—125 degrees or more. The Anza-Borrego Desert is one of the hottest, driest deserts in the world with less than six inches of rainfall per year, said Magargal, and as we all chugged our water, we were inclined to believe it. Back in the bus, we bounced quite vigorously through a series of washes—areas of water flow after a heavy rain. Magargal listed them as we bumped along: Palm Wash, Ella Wash, Palo Verde Wash, Short Wash and Font Wash. The evidence of water was clear—the hardened ground resembled mudflows along riverbeds. In these washes are various shrubs, including the catclaw acacia and palo verde tree, which thrive with the occasional bursts of water. We drove through the badlands, where nothing grows, and began our climb up to Font’s Point. Along the way, we passed through an ocotillo forest. The ocotillo resembles a cactus to the untrained eye; its long, spindly limbs all extend from the base of the plant, and are covered in barbs rather than leaves. However, Magargal informed us that they are actually shrubs rather than a true cactus. There must have been a recent rain, he said, since the ocotillos that we passed were blooming, with a few flame-colored leaves on the top of each branch. After some pretty impressive 4x4ing, we arrived at the pinnacle—Font’s Point, known as California’s Grand Canyon. This staggering viewpoint gives an impressive 360-degree view of the desert that surrounds the town of Borrego Springs. From here, you can see the badlands far below us, the Salton Sea 30 miles away and many of the landmarks we’d already passed through. All of the geological features that we had been looking at up close were now part of this tremendous desert valley that, from here, one can imagine as a massive, lush and green oasis, when an abundance of water—rather than the lack—defined its existence. Tanya Laing Gahr is a Canadian travel writer and photographer who lives in Cranbrook, British Columbia. The Anza-Borrego Desert State Park covers 600,000 acres, with elevations ranging from below sea level to 8,000 feet. Bighorn sheep, jackrabbits, cougars and coyotes are some of the larger animals that make their home in the desert. This is also a great place for birdwatchers. In summer, the temperature can exceed 125 degrees; in winter, it can drop below 30 degrees. The Anza-Borrego Desert has been rated one of the top 10 places in the world for stargazing. Borrego Springs is an RV-friendly destination. 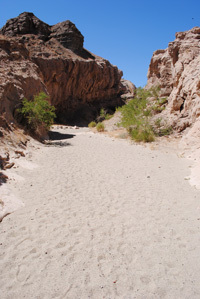 There are campgrounds at Anza-Borrego Desert State Park and Agua Caliente County Park and at private parks, including The Springs at Borrego, Leapin’ Lizard RV Ranch and Palm Canyon Resort. For information on guided tours, contact California Overland at (866) 639-7567 or visit californiaoverland.com.